Description: Apples to Apples consists only of two decks of cards: Things and Descriptions. Each turn, the current referee selects a Description and players try to pick, from the cards in their hands, the Things that best match that Description. The referee then chooses the Thing that appeals most and awards the card to the player who played it. The unusual combinations of Things and Descriptions are humorous to the extreme, and will quickly have the entire room in an uproar. Once a player has won a pre-determined number of cards, that player wins. 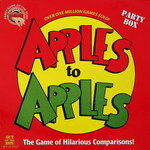 The original Apples to Apples Core Set was the first entry in the Apples to Apples Series. The Apples to Apples Core Set had four card expansions: Apples to Apples - Expansion Set #1, Apples to Apples - Expansion Set #2, Apples to Apples - Expansion Set #3 and Apples to Apples - Expansion Set #4, that provided more Things and Descriptions to choose from. In 2003 Apples to Apples Party Box Edition was released and included the Apples to Apples Core Set of cards as well as the cards from Apples to Apples - Expansion Set #1 and Apples to Apples - Expansion Set #2. It comes in the standard box, or packaged in a "Crate" edition with a wooden box.